Barriers to Telemedicine are Falling. Why Aren’t More Patients Engaging? Telemedicine once required sophisticated equipment and skilled operators. That’s why remote medical visits were largely done with the patient in one medical office location with a provider, conferring with a physician or radiologist located at a distant site. The rise of high-speed internet connections and mobile devices with high definition cameras, along with modern easy-to-use software have changed all of that. These days it is safe and simple to increase patient engagement with a remote video visit with their doctor. So, why aren’t more of them doing it? A Towers Watson study found that 35% of employers with on-site health facilities offer telemedicine services and an additional 12% intend to in the next two years. The same study found that by 2017, about 70 percent of employers plan to offer telemedicine services as an employee benefit. According to an IHS report, the telemedicine services field is positioned to explode by 2018 with an anticipated 7 million patient users, up from 350,000 patient users in 2013. An American Well study found that 20 percent of consumers would switch their current primary care provider if another PCP in their area offered telehealth visits. That’s a lot of momentum, yet some practices find that getting patients to choose a video visit over an in-office encounter is somewhat challenging. Despite the fact that many barriers have been eliminated, adoption isn’t happening as quickly as many practices would like. Patients don’t know that the practice offers telehealth or how to schedule an appointment. Lack of awareness is a major obstacle to adoption in many practices. Patients need education about how video visits work, when they should be used, and how to get scheduled. Chiron Health has made patient marketing a central part of our solution. We market telehealth to our client’s patients, providing the option to request an appointment online. Patients are smart to be concerned about making sure that their health information is secure when transmitted over the internet. They want assurances that details related to their healthcare will be kept private. If you choose to utilize an HIPAA compliant solution like Chiron Health, you can reassure patients that their information will be as secure as if they had an in-office visit. We enter into Business Partner Agreements with our clients to ensure regulatory compliance and give patients an added level of comfort. For those unfamiliar with the research regarding the use of telemedicine may be concerned that the quality of care will not be the same or that health outcomes might suffer. Fortunately, the data is clear that video-visits are a safe and effective way to serve the needs of many patients. Although not every case is appropriate for telemedicine, study after study shows that it can be as effective as in-person care. There have been a lot of changes recently regarding how insurers cover telemedicine. State legislators across the country have worked to make sure that video-visits are covered by private payers. In fact, 30 states have so-called “parity” legislation requiring reimbursement for telemedicine and more states are poised to do so. Chiron Health helps patients and providers alike by including built-in eligibility verification into our solution. We also offer a reimbursement guarantee, meaning that once a visit is verified, you and your patient can be confident that the encounter will be covered. Most Millennials are very comfortable with web-based apps and use video application on a regular basis, but what about older adults aren’t they intimidated by this kind of technology? Sure, some of them are, but a surprising number of older Americans embrace technology for health management. In fact, 53% of Americans over the age of 65 say that getting access to their health information is one of the leading reasons that they are online. Of course, not all technology is created equal so you need to take care to choose a solution that will be easy and intuitive for your patients or you risk turning them right off. Chiron Health has developed an elegant user interface for this very reason. We also offer in-application support for your staff and patients. 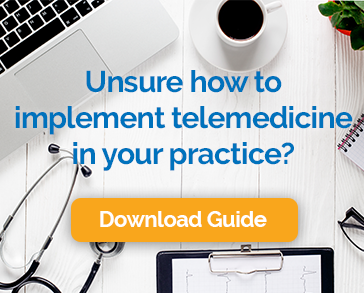 Practices that want to accelerate the growth of telemedicine should focus on patient education and be sure to choose the right technology partner. We’d love to chat more about how Chiron Health might help you increase adoption and patient satisfaction at the same time.